Dylan Gwynn-Jones joined Aberystwyth University in 1999 and is currently a Reader in the IBERS Ecology Group. 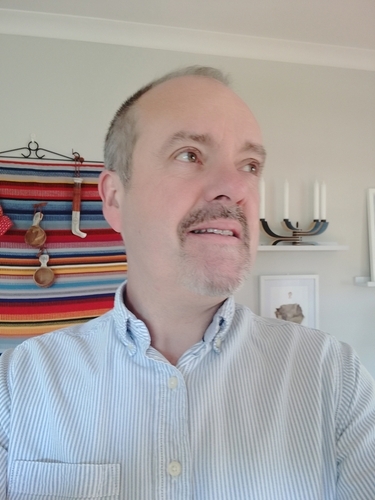 He previously worked as a post-doctoral researcher at the Universities of Sheffield (1994-1999) and Manchester (1992-1994) engaging with research on several European projects. Research targeted the effects of future elevated carbon dioxide and UV stress impacts on plants and communities. This followed a Ph.D. at Bangor University (1989-1992) jointly with CEH Bush in Edinburgh on the future effects of elevated carbon dioxide on trees. His research interests on elevated carbon dioxide and also plant stressors continue to the current day but has diversified to also include agricultural and horticultural crops. He now investigates ‘stress tools’ and using stressor exposure to manipulate plant chemistry and crop quality. Dylan teaches is a highly experienced teacher, a Fellow of the HEA and delivers modules to a broad range of degree scheme at undergraduate and post-graduate levels at IBERS. Dylan Gwynn-Jones is an experienced teacher who delivers field, laboratory and lecture room classes to both undergraduate and postgraduate audiences. He is a keen advocate of experiential learning and the development of skills that can catalyse the understanding of a topic and enhances future employability. Examples from his commercial interactions and research are embedded into his teaching. Post-graduate Certificate in 'Teaching in Higher Education' from Bangor University (2005). 'Excellence in Teaching award' from Aberystwyth University (2004). External examiner: School of Biosciences Cardiff University (2015 – present) – examiner for the undergraduate subject areas of Biology, Ecology and Zoology. Field research on heath communities dominated by the family Ericaceae: a) The effects of future environmental changes (elevated carbon dioxide, enhanced UV-B and increased temperature) on the carbon dynamics of sub-arctic heath communities in Swedish Lapland; b) Investigating the control of the invasive ericaceous species Rhododendron ponticum in heath and moorland communities in collaboration with Snowdonia National Park Authority. f) Using stress tools to manipulate crop quality in hydroponic systems - in collaboration with Phytoponics Ltd; g) Pop up Agriculture for polar regions - in collaboration with the British Antarctica Survey, Cambridge; h) Insect vision in glasshouses - in collaboration with the National Botanic Garden of Wales; i)Circular economics applied to hydroponics - in collaboration with Freeland Horticulture. · Director of Research (Agriculture and Environment Theme). · IBERS Director of Welsh Language and Culture. · Scheme coordinator (Ecology C180, Plant Biology C200). · Member of the Institute Learning and Teaching committee. · Module coordinator (BR23620 Arctic Ecology Field Course; BG21420 Arolygu Ecolegol; BR13510 Ecology; BR21120 Climate Change: Plants, Animals and Ecosystems; BR21420 Ecological Surveying; BRM4920 Frontiers in the Biosciences). · Lecturer / contributor to the following modules (field, laboratory and class): BR01440 Organisms and the Environment; BR13510 Ecology; BR12410 Study and Communication Skills; BR23620 Arctic Ecology Field Course BR21120 Climate Change: Plants, Animals and Ecosystems; BR21420 Ecological Surveying; BG21420 Arolygu Ecolegol; BR23420 Research Methods; BR32330 Dissertation; BRM4920 Frontiers in the Biosciences; BRM6520 Introduction to Environmental Law and Environmental Impact Assessment; EAM4020 Fundamentals of Remote Sensing and GIS. · Researcher: attracting competitive external funding from UK and international sources; managing staff and budgets; collecting and analysing data, writing papers and research reviews (including reports and book chapters) for peer reviewed journals; public and stakeholder engagement. A polyphasic approach for assessing eco-system connectivity demonstrates that perturbation remodels network architecture in soil microcosmsStamou, G. P., . Monokrousos, N., Gwynn-Jones, D., Whitworth, D. & Paptheodorou, E. M., 2019 , In : Microbial Ecology. Shrub establishment favoured and grass dominance reduced in acid heath grassland systems cleared of invasive Rhododendron ponticumJones, G. L., Owen, R., Scullion, J., Winters, A., Jenkins, T., Ratcliffe, J., Tomlinson, M. J. & Gwynn-Jones, D., 2019 , In : Scientific Reports.9, p. 2239-224911 p., 2239. Larval crowding during an insect outbreak reduces herbivory pressure on preferred shrubs in a warmer environmentGamarra, J., Callaghan, T. V., Bylund, H. & Gwynn-Jones, D., 2018 , In : Agricultural and Forest Meteorology.263, p. 180-1878 p.
Can the optimisation of pop-up agriculture in remote communities help feed the world?Gwynn-Jones, D., Dunne, H., Donnison, I., Robson, P., Sanfratello, G., Schlarb-Ridley, B., Hughes, K. & Convey, P., 2018 , In : Global Food Security.18, p. 35-439 p.